When West Side Story by Leonard Bernstein, Stephen Sondheim, and Arthur Laurents premiered on Broadway in 1957 it did so to rave reviews and was declared “a splendid and super-modern musical drama.” The idea was to write a modern version of Shakespeare’s Romeo and Juliet, but to use New York as the setting and transform the love conflict from one involving warring families to a feud between Polish Americans and Puerto Ricans. Yet, as West Side Story became what some called “the quintessential American musical,” it did so as it confronted accusations of racial stereotyping. As Alberto Sandoval-Sanchez points out, the love story on the surface masks "an explicit discourse of discrimination and racial prejudices toward immigrant Latino/as." The question for contemporary American audiences has become, how does that discourse configure itself today? In 1999, Amherst Regional High School’s production of West Side Story was cancelled when several Puerto Rican students and parents complained about what they perceived as stereotypical representations in the musical. It ignited a passionate controversy in the Pioneer Valley that made international news. The dialogue that emerged out of that controversy is the basis for an original theater piece titled, West Side Stories, written by Harley Erdman, Roberta Uno and students from the Pioneer Valley Performing Arts High School (PVPA) and Amherst Regional High School. 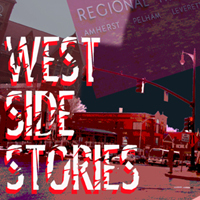 West Side Stories, a multi-dimensional exploration of race and place through music, dance, sketch comedy, satire, and drama, will take place on Saturday, February 21, 2004 at 8 PM and on Sunday, February 22 at 2 PM at the University of Massachusetts Bowker Auditorium. Directed by Brian Marsh, it will feature students from PVPA, Amherst Regional High School, and Project 2050.